I love that same-screen games continue to find appeal on PC. It's hard to say how many PC gamers own USB gamepads, and yet Towerfall, Spelunky, Gang Beasts, Nidhogg, and others have come to represent a tiny renaissance for local multiplayer on our platform. It's a trend that coincides with Valve's still-developing push into the living room, too. A handful of new or recent same-screen games are on display at the Indie Megabooth at PAX Prime this weekend. The booth is consistently one of the best consistently attractions of the show, if only because the rows of game tables feel as intimate as a community bake sale, with no distance between chef, product, and customer. Lovers in a Dangerous Spacetime was one of the games I've enjoyed most at the Megabooth. It's essentially a miniature, cooperative platformer inside of a shmup. Two players (or one, with a “loyal space pet” AI) guide a ship through a hypercolored, hostile outer space, flying around asteroids and fending off enemy fighters that emerge from the edge of the screen. But to do that, you have to move your thimble-sized avatars in real time between different ship stations, up and down ladders and through small corridors. There will the multiple ships at release, but the pink globe my partner and I were put in had a north/south/east/west gun configuration, with individual stations for each position. The helm was at the center of the ship, and a shield station and special weapon (with a long cooldown) sat at opposite corners of the ship. When these stations are unoccupied, of course, they're inactive. The exception is the shield, an arc that covers about 20 percent of the ships circumference and only deactivates when you're changing its position. Lovers' cute theme (our goal was to rescue space bunnies from planet surfaces by shooting their cages) disguised its difficulty. A few minutes in, my partner and I were perpetually swatting robots, swapping stations, and yelling at each other respectfully to get us out of danger. Worst were the times when we got so overwhelmed that we had to abandon the helm, jumping our tiny avatars to another station, leaving us a stationary target for even more ships to gather around us. The urgency of it feels like a episode of Star Trek where most of the bridge crew have died and everyone else has to pick up the slack, but that plate-spinning is essential to the communication that the game stimulates. If you want to pilot the ship to the left but your teammate doesn't adjust the shield to cover the enemies that are tailing you on the right, you might expose yourself to a bunch of damage. We were most effective when the player at the helm was doing the thinking and talking, and the second player was reacting to orders. At one point we retrieved a power gem that we could dump into any of our stations, boosting its effectiveness. We died after less than 10 minutes, but the roguelike-like difficulty was welcome. Another pair of players I saw made it to a boss enemy, an elongated, shmup-style space eel with individually damageable segments. It swirled around the ship, making shield repositioning a constant need. 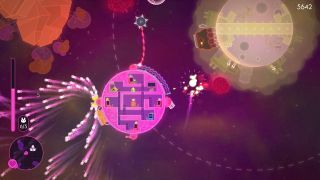 Lovers in a Dangerous Spacetime is a welcome addition to our platform's ever-growing pile of local co-op games. A release or Early Access date isn't set yet, and the main thing I'd like to see the game's Canadian team Asteroid Base work on before release is getting as much enemy and ship variety and unpredictability into Lovers as possible.